And with that in mind I decided to schedule 5 session to attend on day 3…. clever eh? The session focused on using the Hyperic agents to help extend the functionalities of vCenter Operations Manager (or vRealize Operations). Hyperic is agent-based and so doesn’t care if it is deployed on a physical server or a VM – it integrates with the OS and auto-discovers the system resources, processes and services, and can even discover applications and their dependencies. The session demo’d quite a few plugins (MSSQL, SAP), the one that caught my eye was the Microsoft Exchange Plugin and showed how the Exchange environment was auto-discovered and how it was viewed within the vCOPs dashboard. It’s an “out-of-the-box” plugin that auto-discovers mailboxes, CAS components, DAGs, etc….. and for each component it has custom health definitions to provide clear understanding of the Exchange environment. Thankfully I wasn’t disappointed! We had key engineers from Project MARVIN (Modular Automated Rackable Virtual Infrastructure Node) give us a deep dive on how the project came about and show us the 8-9 months lifecycle from design to the EVO:RAIL solution. So what is EVO:RAIL? Well it’s the worlds’ first VMware-integrated hyper-converged infrastructure solution. The engineers primarily set out to create a solution that would be simple to deploy, simple to configure and simple the manage…. and they’ve achieved their goals! The GUI is amazingly simple and user-friendly and the demo of it actually deploying looks so easy that my 3 year old nephew (or 63 year old dad) could probably do it! (For the more techie guys, you can still get into the guts of vCenter so the underlaying software is still accessible). 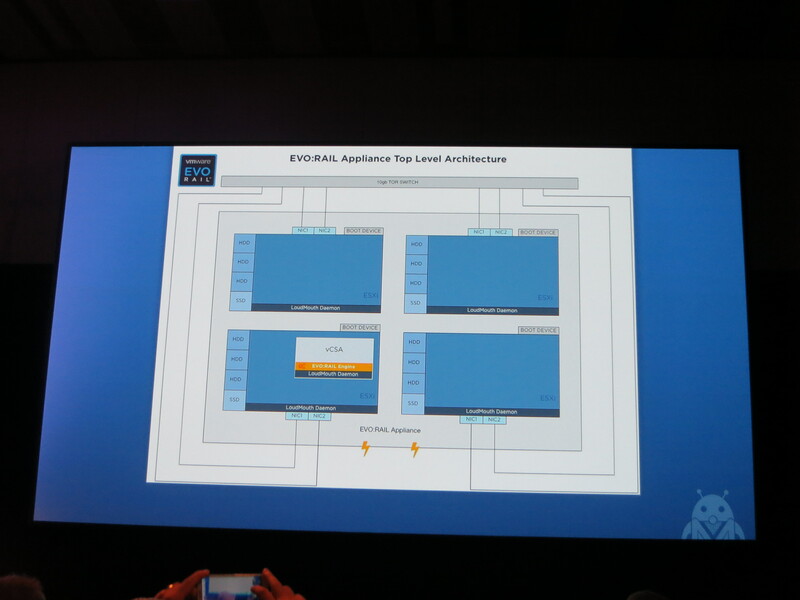 In a nutshell, EVO:RAIL is a single SKU product that consists of a 2U high 4-node appliance with approximately 100GHz of compute, 768GB of memory and 14.4TB of raw storage (plus 1.6TB of flash capacity for IO acceleration). It can scale out up to 4 appliances and scaling out is as simple as connecting it in and letting the appliances auto-discover each other! Underneath the hood, it consists of vSphere Enterprise Plus, vCenter Server Appliance, virtual SAN, Log Insight, and the EVO:RAIL Engine. The recommended maximum of VMs on a single appliance is around 100 VMs or 250 VDIs. Unfortunately due to scheduling constraints, I didn’t have time to get to play with an EVO:RAIL appliance…. I would have loved to take up the EVO:RAIL challenge that was going on in the hang space! One of the new features of the forth-coming vCOPs 6.0 is the ability to create actionable recommendations to events triggered within vCOPs. You basically use adapters to capture metrics as well as trigger actions for remediation. It was quite a technical session, delving into how you would create XML files and workflows within vCO to help implement recommendations to an alert generated by vCOPs. TBH, it was too much depth for me and I should have really looked at one of the other vRealize Operations sessions instead. INF1502 – What’s New in vSphere? Alot was discussed around what features were in vSphere 5.5u2 and vCD 5.5u2, the new vSphere for ROBO SKUs and of course the vSphere 6.0 beta program. vMotion Across vCenter Servers – builds on the ‘share-nothing’ principle already seen in Storage vMotion. Long Distance vMotion – cross-continental deployments (UK->Paris/Munich) as long as the Round Trip Time (RTT) is less than 100ms. This would obviously help with migrating between data centres across the other side of the country, maybe even help with “follow the sun” type migrations of business services! Multi-vCPU Fault Tolerance – well, at least support for up to 4 vCPUs to start with! Seems they’re moving from the old ‘record/replay’ technology to ‘fast checkpointing’. I believe at present it will be limited to 8 vCPUs used per host for FT. Content Library – providing storage for VM templates, ISOs and OVFs and allows publishing and versioning of the content. Virtual Data Center – aggregating of resources to help automate policy-based provisioning. This was an overview session (funnily the deep dive was scheduled before the overview session! 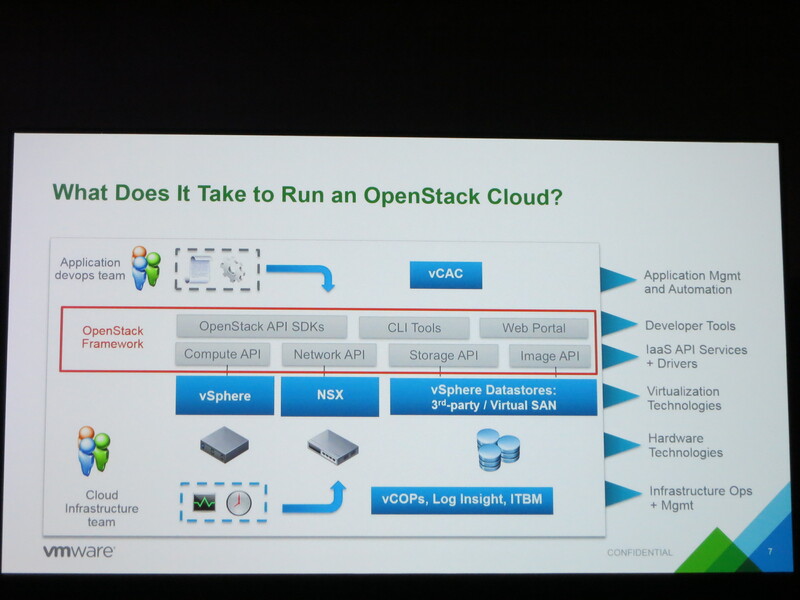 ), so it mainly discussed the interaction between VMware and OpenStack over the past few years. What they’ve contributed to the open source project and how they are enabling customers to adopt OpenStack. It seems that in the market, not many people know what OpenStack is for and they were very quick to highlight that some C-level members assume that they can get rid of their virtualisation technology and simply drop in OpenStack. OpenStack is actually a framework for providing developers with APIs and tools that has to sit on top of a virtual infrastructure! OpenStack is an area I’m not very clued up on, and this session was more for me to understand what the VMware Integrated OpenStack (VIO) was about. 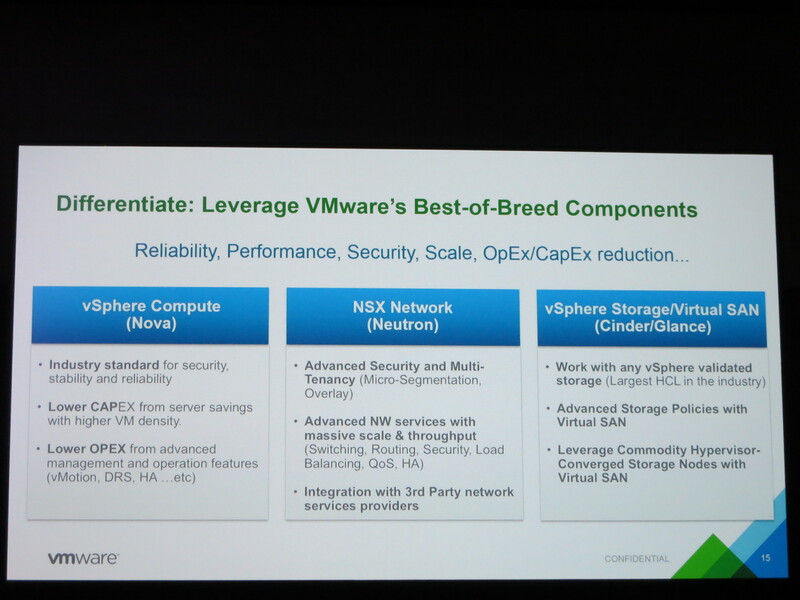 The following slide shows how certain VMware products will integrate with OpenStack. So now that VMworld is over, I have to say that I’m happy that the two topics that I had earmarked to learn as much as I could on was fulfilled – the technical deep dives on VVOLs and EVO:RAIL were the two sessions I was looking forward to the most, and they didn’t disappoint! The only criticism I have for VMworld – and it’s the same problem I experienced last year – was that the whole event is REALLY hard going for those who actually want to go to VMworld to LEARN!! If you pack your sessions full like I did, you’re pretty much running to each room due to over-running sessions and you’re also trying to find some time in between to nip to the toilet, to grab a coffee or drink, or even to grab lunch! I don’t think I ate a proper lunch on any of the days of the conference! Note: If you’re UK based, then stay-tuned for the VMworld 2014 update session that I will be running alongside my MTI colleagues in the not-too-distant future!